HUNTINGTON STATION, Long Island, N.Y. — Suffolk Police accident investigators say that a man trying to cross a Huntington Station street in the evening hours suffered critical wounds after being struck by a sports utility vehicle. Newsday reported that the incident happened just after 9:00 p.m. The injured pedestrian required a med flight to a trauma center in the area for treatment of his extensive injuries. Suffolk police are still working to determine what transpired. The police refused to release any identifying information about the accident victim because the police had not spoken with his family before issuing a press release. Suffolk police and other first responders received a call for a pedestrian accident at New York Avenue in an area just to the north side of West 11thStreet in Huntington Station. Upon arrival, officers learned that the person behind the wheel of a 1999 Honda CRV drove into the pedestrian. A photograph of the accident scene shows an area of a crosswalk cordoned off by police with crime scene tape. Officers did not specify in the release if the pedestrian was walking in the crosswalk when the CRV hit him. The pedestrian was severely hurt in the accident. 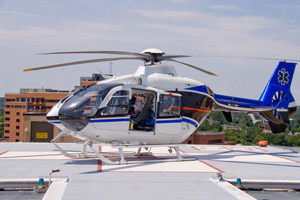 The news release from Suffolk police stated that a Suffolk police helicopter landed in the area of the crash and took the injured man to Stony Brook University Hospital. Stony Brook University Hospital physicians admitted the man into their care with critical injuries. There was no update available concerning the pedestrian’s medical condition. Suffolk police said that the driver of the 1999 CRV did not experience any injuries in the collision with the pedestrian. Suffolk police impounded the CRV to perform the required safety checks. The police did not release their findings from the safety inspection. However, the Suffolk police press release did explicitly state that the driver of the CRV was not charged with any criminal sanctions because of the collision.